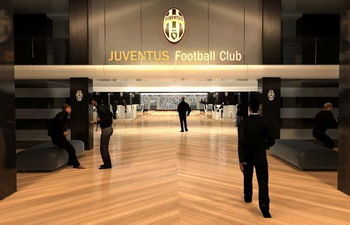 The interiors of the Juventus’ new stadium have been designed by Pininfarina. The team at Pininfarina Extra has aimed to improve and bring fresh thinking to all the internal areas accessible by spectators: the honour lounge, boxes, seats, benches, locker rooms and restaurants. "Collaborating to the making of Juventus’ new stadium," commented Paolo Pininfarina, the President and CEO of Pininfarina's Extra division, "allowed us to express once more our creativity on a Turin city’s icon, after the yet lucky experience of the Olympic Cauldron. During the planning of the plant we took advantage by the correspondence between Juventus’ and Pininfarina’s brand identity, both with elegance, essentiality and with that Italian touch that becomes a distinctive sign. Our work was focused on giving style and aesthetic personality to the stadium, never forgetting functionality, comfort and safety, basic requirements for an installation which can hold up to 41,000 people." Designers have aimed to join up present with the future while keeping the architectural memory of the old facility alive, creating new symbol for the city of Turin, for the supporters - who, starting from this season, will support their team in a wholly white and black stadium - as well as being for all sports fans and for general citizens. In particular, the project set up by Pininfarina Extra involves designing the interiors of all the stadium’s areas – floors, lights, furniture, boxes and lounge – as well as the seating. 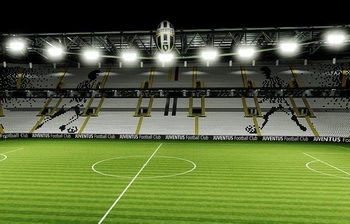 The seats for the audience have been drawn up in the shape of pixels of a huge picture, that, when the stadium is empty, show symbolic images of Juventus’ great champions.